The biggest WWE PPV (pay-per-view) event, Wrestlemania has arrived. On April 8, 2018, the 34th edition of WWE Wrestlemania. So, if you are a fan of World Wrestling Entertainment, then you must be waiting for this moment. Don’t worry, if you can get yourself a ticket to watch the matches in the stadium. We have brought to you a solution – how to watch it online and stream it live. Here, we have listed a number of ways to watch the PPV on TV / computer at your home or on the smartphone / tablet, if you are on move. Let’s go through the breakdown now. 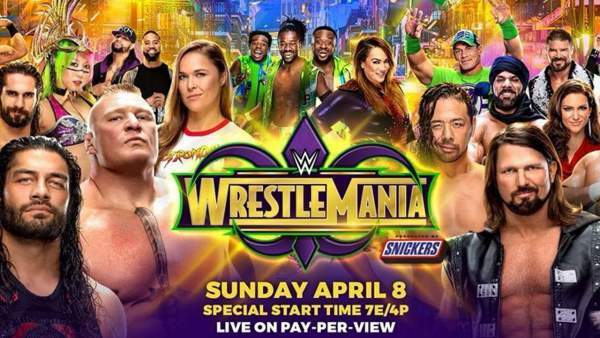 The best way to save money and watch Wrestlemania 34 is – the WWE Network. As of now, the new subscriptions are free of cost for trail periods. Later on, you can cancel the same. If you love the programme, then you can also continue the subscription by paying the fee. It will offer the classic wrestling programs like WWE, WCW, ECW, and others for just $10 a month. Cable or satellite operators also provide Wrestlemania subscriptions to their users. You can purchase it if you feel, you are in the corner where the internet is not so fast to live stream it. But, you will need to check the cost. It can be upto six times more than the streaming service. Besides at yor home, you can also watch it at sports bars and restaurants as they also play such events as well. However, you need to identify your spot as not everyone is interested in the WWE stuff. And one more think, if you are going to watch the seven hour show at a restaurant, you will be expected to order some food or drinks. It’s because waiting and watching such a long event won’t be a free trip. You can access WWE Network through multiple ways. It can be phones, tablets, PC, etc. The smart TVs of today’s generation like Apple TV, Amazon Free, and Google Chromecast – are all able to play the channel via the network app. You can enjoy the event even on Xbox 360, Xbox One, PS3, and PS4. The apps are available on their stores. However, it’s not available for Sony Nintendo Switch owners yet. Wrestlemania 34 is going to start at 5 pm ET with the kickoff show on Sunday. It will be two hour show. Thus, the main event will kickoff at 7 pm ET / 4 pm PT. The kickoff match will be available on WWE Network and on the official YouTube channel of the company. Stay tuned to The Reporter Times for more WWE Wrestlemania 34 (2018) news.